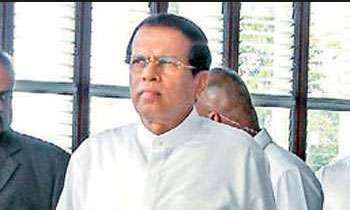 President Maithripala Sirisena arrived in the country last night after concluding his visit to the Philippines. He left for the Philippines on a five-day state visit on January 15 and during his stay, the President held bilateral discussions with Philippines President Rodrigo Duterte. Must be looking fresher than before at what expense. He is the Presdent of this country and trained himself well to go back on his word. He returned..? Oh, God, Why? Why was the God so unkind? How was the cashew this time? What is the total bill for the trip? It will be better if he remains abroad for sometime without confusing us all the time. What new ideas did he gather from Phillipines? Where else can he go? Why not send him to COVENTRY.